(by Sarah Knapton, London’s Daily Telegraph) – A schoolboy in Germany suffering from a devastating disease which left him covered in blisters and confined to a hospital bed is playing soccer after being fitted with an entirely new skin. He was admitted to a hospital in 2015 at the age of 5. Although doctors then attempted skin grafts taken from his father, none were successful and he was forced to live in the burns unit at Bochum’s Children’s Hospital in the Ruhr district because most of his outer skin was missing or horribly damaged. In desperation doctors contacted experts in other countries, and eventually found a group of Italian scientists who were experimenting with skin cell regeneration techniques. In a world first, the team took a sample of skin just 1.5 square inches, extracted the stem cells then genetically engineered them back to healthy cells. 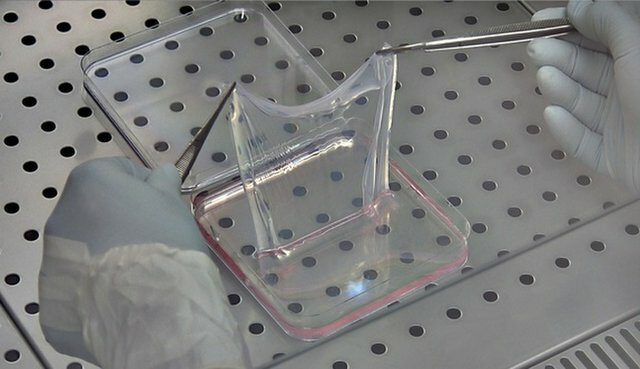 Researchers created this sheet of skin from cultured cells that had been genetically modified. His new skin no longer blisters and the youngster has been able to play soccer for the first time and enjoy the rough and tumble of a normal schoolboy’s life. Dr. Michele de Luca, from the University of Modena, Italy, who led the gene therapy team, said: “The patient was in danger of life. The prognosis was very poor, but he survived. Junctional epidermolysis bullosa, which affects just one person in every two million, is caused by a faulty Lamb3 gene, and can eventually lead to skin cancer and death. In the new procedure, the Italian scientists used a virus to insert a healthy version of the gene into the boy’s stem cells and then used them create sheets of genetically modified tissue, free from the terrible gene mutation. Over the course of three operations surgeons attached the new skin grafts to the boy’s body. Once established, the regenerated epidermis began to heal itself and stopped blistering. Scientists have previously only tried the technique for very small areas of skin, but the success proves that it could be used for larger areas, potentially offering hope for burns victims. ….. The research also revealed new details about human skin, showing for the first time that the epidermis is sustained by a small number of long-lived stem cells with a powerful ability to renew themselves. These were vital to the process that allowed the skin to regenerate itself completely about once every month. Writing in the journal Nature, the scientists said: “Transgenic epidermal stem cells can regenerate a fully functional epidermis virtually indistinguishable from a normal epidermis. “The different forms of epidermolysis bullosa affect approximately 500,000 people worldwide. In June 2015, Hassan was admitted to the burns unit of Ruhr University hospital in Bochum, Germany. Covered in blisters, 80 per cent of his skin was open and bleeding. It was one of the most severe cases that doctors had experienced. Attached permanently to a morphine drip, his pain was so extreme that doctors expected him to die. In November 2016, Tobias Hirsch, a plastic surgeon at the university hospital, successfully transplanted new skin to almost the entirety of Hassan's body. All the skin was grown in a laboratory by Michele de Luca, a world-renowned expert in epithelial stem cell biology. "As I saw the results after the first operation it was like a miracle to me," Hirsch says. "There really was new, solid skin." In October 2015, and to the surprise of all the surgeons working on the case, the first transplantation to Hassan's four limbs was a success. For the first time doctors were able to prove that transgenic stem cells could regenerate an entire tissue. In simple terms, they realized it was possible not just to grow skin, but also for the skin to thrive when transplanted. Hassan's skin was so fragile he was covered in wounds, blisters and recurrent infections that were largely untreatable. The entirety of his back and legs were covered in open sores. Hassan had been transferred to the specialist burns centre as a last resort when his condition began to rapidly deteriorate and the condition spread across his whole body. "When we got him in our burns centre he was in a septic state, so we had a lot of problems from the first day keeping this kid alive," Hirsch says. Michele de Luca has worked in epithelial stem cell biology for 20 years. De Luca told the Bochum team that he could grow Hassan enough skin inside his lab to replace the 80 per cent of that he had lost. Scientists had never tried to transplant this magnitude of lab grown skin on to a human. De Luca agreed to take a four-centimetre-square biopsy from an unaffected part of Hassan's skin and began to grow the corrected cell population at his Centre for Regenerative Medicine in Bologna, Italy. The process took four weeks. "The basic technology is very similar to burns treatment that we have been using in the past," de Luca says. "In other words, you take a biopsy, you isolate the polygenic cells, then the difference is that you genetically modify those cells and make genetic corrections to introduce the new copy of the gene, in this case LAMB3 which is needed to restore the original machinery in the skin." The sets of cells are grown in large numbers, half of them being used to prepare the culture grafts of different sizes. The grafts ranged from 50-100 centimetres in size. After a month, De Luca was ready to transport the graft to the hospital in Bochum, so they could be applied to Hassan. Transplanting the skin was extremely meticulous and risky. "We first divided the wounds and open areas thoroughly in order to achieve a clean wound bath with a good cleaning situation," Hirsch says. It is essential to get rid of all the bacteria that is placed on the chronic wounds. Then Hirsch applied the grafts provided by De Luca. "What is quite challenging is to make sure the grafts attach properly to the wounds because in this patient you can't use any plastic strips to fix them." The transplanted skin naturally adheres to the wound bed with the help of the right medication. If kept in place, they fully engraft to the body in a few weeks. The team felt confident to proceed, completing the transplantation to the rest of his body the following month. The results of the work were published in the journal Nature. Crucially for Hassan, this treatment set his recovery apart from previous skin transplant procedures. Usually, due to the severity of the skin damage, burn victims are unable to grow hair on their transplanted skin or develop functioning sweat glands. For these patients, an ointment must be applied to the transplanted skin twice a day for the rest of their life. "We found here that the appendages in the skin didn't need any ointment for the child, we saw hair regrowth and no further need for ointment which is fantastic," Hirsch says. Hassan's parents were overwhelmed. "They told me this was like a dream," Hirsch says. Eight months after his surgery, Hassan was discharged from hospital. Now, Hassan plays football, goes to school and enjoys life with his siblings. For the past two years, De Luca and Hirsch have kept a close eye on him. Now, they are finally confident his recovery has been successful. "To move from constantly being on morphine to playing [soccer] is obviously quite an improvement," Hirsch says. "For me, as Hassan`s surgeon, it is a great success to save his life and bring him back to an almost normal daily life," he adds. But the impact of this groundbreaking procedure goes beyond a single case. "For the first time we are able to show that an insufficient solid organ has been successfully replaced by genetically-modified stem cells," Hirsch explains. "I worked during my whole research career on gene transfer in skin and wounds. However, we have never applied such a treatment to a patient before." Michele De Luca is now undertaking trials on two more patients with similar genetic diseases. "We might have problems that we did not encounter before," he says. "This is going to be discovered only after a phase one clinical trial. We are running other clinical trails at the moment." But for Hassan, very simply, it means a new life.